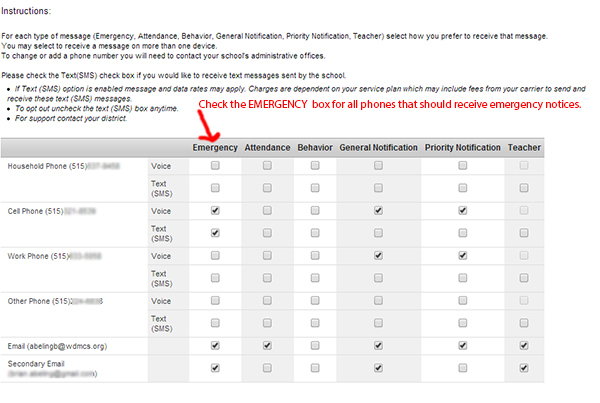 PARENTS: How to sign up for emergency notification calls from West Des Moines Schools. West Des Moines Community Schools utilizes an automated calling system to notify families of weather and other emergency notifications. The caller ID on your phone will show the number 515-633-5599. The numbers that will be called are the phone numbers you submitted to your school, which are stored in Infinite Campus (IC). You can go into IC to indicate which numbers will receive the call. Directions are below. If you do not receive a test call, please contact your school office to let them know you did not receive a call and would like to update your Infinite Campus information. How do I indicate which phone number(s) will be called for the weather notifications? NOTE: these steps are only for PARENTS, not for staff only. Once in Campus, click on CONTACT PREFERENCES at the bottom left. Under EMERGENCY, click on the box to place a check mark next the phone number(s) you wish to receive the weather notification alerts. What if I have a phone number that is not listed and I want to add it? In Infinite Campus, click on FAMILY MEMBERS, next to each member is an UPDATE button, you use this feature to add/edit/change phone numbers or email addresses for individuals in your family. I’m logged in as myself and I can change my personal preferences for whether I get a call, email or text – but how can I change these preferences for my spouse? With your account you can only change your preferences you can not changes someone elses preferences, to change their preferences they must log into Campus with their account. I don’t have an Infinite Campus account. How do I change my weather notification preferences? You can call your school office and they can provide you with an account or they can change your preferences for you. This entry was posted in for Parents, for Staff, for Students, Infinite Campus on January 4, 2012 by Brian Abeling.